- 1,600 Gazprom (GAZ:FRA) shares. The company is at its lowest price in a while. Dividends are expect to be 4-5% and the long term growth prospect. - Gazprom stock is being heavily speculated on. Couple of years ago the company would worth 3 times more. Fundamentally it hasn’t changed – strong resource base and good dividends. Good thing about it – being a state controlled it is not moved by dividend growth seekers. Many companies start compromising their investment strategies, paying the dividends instead. This would affect so called total shareholder return (dividends + difference is share price in a given period). 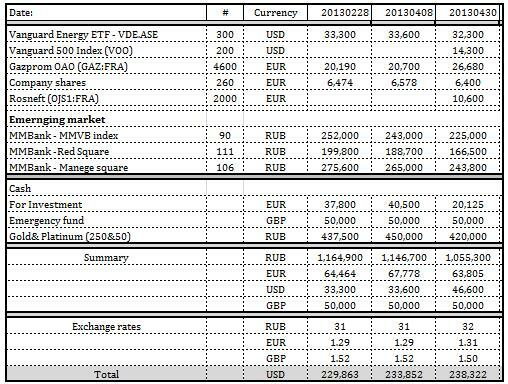 Gazprom continues heavily invest in future growth, only next year alone proposed investment programme is over $44bn. - While keeping my nest egg in different currencies has its advantages – keeping it balanced, downside of it keeps losing money right now, as USD is relatively strong. - I invested in Vanguard S&P at the market peak, while many a waiting for a correction (~10%). The reason and missing the bull was entirely personal and done for sanity of mind. No regrets there. - Still over 43% of my nest egg is in cash. I will aim to reduce it to 25% by end of the year. I can understand how balancing multiple currencies can be difficult. Having some liquid money on hand is pretty smart in case a great opportunity comes along :D But I agree that you shouldn't need more than 25% of your assets in depreciating paper money. Do you have any plans to deploy your extra cash or are you waiting for a meaningful correction in the stock market first? You see, market correction will unlikely to help the financial independence, as such. More over, I think that people and institutions were sitting for such a long time on piles of cash, that they will keep on putting in stocks, in spite the fact that they overvalued and dividends payouts are going down by a year.